Description: Listen to the melodious calls of the Loon echo across the mountain lake as this aquatic bird wades across the water. The Loon Left Wall Sconce projects beautiful ambient light with stunning Silver Mica shade, which is complemented with a handsome frame, decorative accents, and hardware in a Dark Burnished Antique Copper finish. 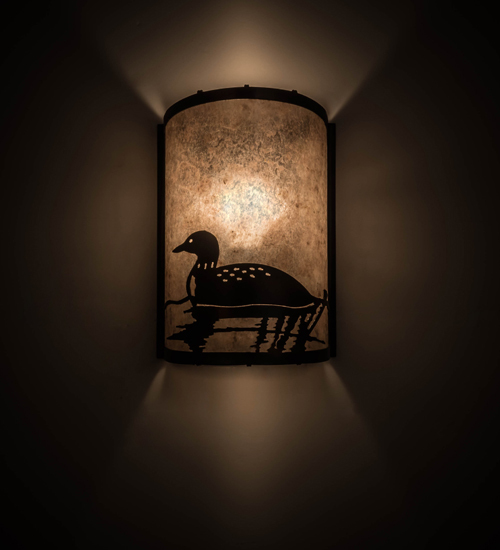 A matching Loon Right Wall Sconce (68173) is also available. Custom sizes, styles, and colors are offered, as well as dimmable energy efficient lamping options such as LED. The 8-inch wide wall fixture is UL and cUL listed for dry and damp locations.